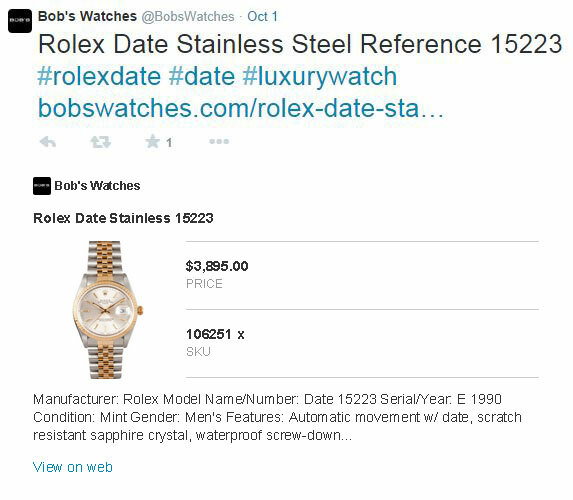 Twitter product cards help facilitate rich product data from your website to Twitter. If a tweet is posted or retweeted with a product page URL with Twitter cards enabled, the tweet will include not only the product name, but the image, price, SKU, and a short product description to help engage more click-throughs and ultimately more sales. What are Twitter Product Cards? You can tell a difference between a standard tweet and a tweet with Twitter Product Cards enabled. Product image to automatically be displayed within tweet. People are visual and will be more likely to click or share a tweet with an image. Increase in maximum tweet size. Along with the maximum tweet size of 140 characters, the product name and description allow for more characters in your tweet. Navigate to Configure->Store Settings and scroll to the “Twitter Card Settings” section. Enable the checkbox for “Enable Twitter Cards” and enter your Twitter Username. That’s it! Twitter cards will automatically be enabled on all product pages of your website. You can visit https://analytics.twitter.com/ and login to view your Twitter Analytics data.